Footage of a panda repeatedly grabbing a keeper's leg in China has been viewed 163m times on Facebook in just 4 days. The panda, called Qi Yi, lives at the Chengdu Base of Giant Panda Breeding in southwest China's Sichuan Province. The video hilariously shows the panda clinging to its nanny's leg while he's busy at work. 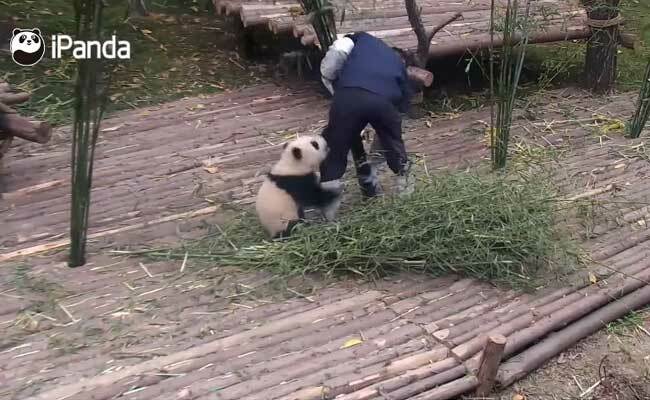 In his first attempt to get rid of the panda, the nanny can be seen lifting the bear and leaving him a safe distance away. The panda promptly runs back and grabs the nanny's leg. In attempt two, the nanny leaves the panda a little further way. But no distance is too much for the clingy panda. It runs across what seems to be an obstacle course just to grab the nanny's leg once again. Attempts three and four have similar outcomes. Sadly, that's where the video ends. The clip is barely a minute long but we could have watched more footage of this 'game' if it was available.